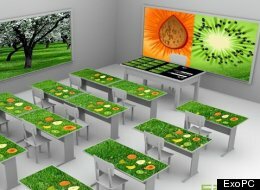 Read the article below on a real classroom of the future. What would your classroom of the future look like? Can you think of items you could invent that would help to improve the classroom? What are some items in your classroom now that could be made better? Share your ideas by commenting below! Kids, don’t stick your gum on these desks. ExoPC, the French-Canadian startup that manufactures a tabletop multitouch surface with a 32-inch LCD display called the EXOdesk, has signed a deal with the government of Panama to furnish a physics classroom with its advanced touchscreen desks. This gives us a glimpse at what a classroom of the future might be. The pilot classroom, which was authorized and will be overseen by Panama’s minister of science, technology and innovation, will feature 20 touchscreen EXOdesks for grade school students, a larger EXOdesk for the teacher, and at the front of the room, a huge interactive multitouch “blackboard.” This is just a giant touchscreen surface hanging on the wall. All of the books, notebooks, writing utensils and other school supplies will be stored within the desk’s memory and be accessible at home at any time via the cloud. Anyway, the desk itself contains an Intel i5 processor and runs a version of Windows 7, with an HTML5 interface specifically designed by ExoPC to suit the curriculum of the physics classroom. All of the desks and the blackboard will be connected via Wi-Fi so that students and the teacher can wirelessly share work and collaborate with one another. This will make it especially easy for one student to help another with a tricky problem. I would like to have an ExoPC because instead of kids hiding their iPads, every one could see what they’re doing. Even if we couldn’t have these desks, it would be neat if we could have an assigned place to slip the iPads in and small printers on our desks. You should draw something up Jack! It sounds like you have quite a few ideas! Tablet desks would be cool. Maybe for the classroom a special device that can support any book? I love the feel of actual pages between my fingers and would like something that feels more like a real book than a tablet. Also on those desks I NEED a keyboard! I hate having to type with iPads! This is such a great visual representation of what is to come. I wonder how far into the future is this placed approx.? I’m in 7th grade and using this for my Science Research Paper “Technology in Schools”. Thank you for the article Joan. There is a YouTube video that has sort of the same representation. You should check it out, https://www.youtube.com/watch?v=uZ73ZsBkcus .